3. US Politics or "What does that have to do with DVD/DivX?" Welcome to this, the 22nd issue, of the Digital Digest LiveUpdate newsletter. As the US election grips the US and part of the world, business is still as usual here down at Digital Digest. There is news of a new region management system, called RCE, that may mean doom for people with multi-region DVD players - but as we'll explain, the news may be exaggerated. 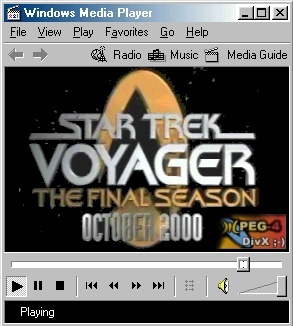 There is also news of a petition to get Star Trek episodes on to DivX, or a similar downloadable/streamable format - during a time when DivX, and Project Mayo (the sequel to DivX) gets even more press. And of course, there is the usual array of new and updated DVD/DivX software to add to your collection. And lastly, we have to add that there will be little or no updates of Digital Digest until November 20th, and throughout the most of December. We apologise ahead of time for any inconvenience caused. RCE - the new (or not so new, if you've been closely following the developments) region management system could potentially leave millions of DVD players worldwide useless, when dealing with DVDs that does feature this new management system. But the reality is that not everyone will be affected, and it does seem that most people with "modified" DVD players will still find that RCE DVDs won't cause them any headaches. So what is RCE? In short, it is a new region control system. DVDs carrying this new system, like The Patriot, will now try to detect the region setting of your DVD player - if it doesn't match the region setting on the disc, the disc will not play. Those with DVD players set to region 0, or have "automatic" region switching will find that discs like The Patriot won't play on their system. However, those with DVD players that allow manually selectable regions, should find that RCE makes no difference - this is not to say that ALL DVD players with manual switching should be okay, as some will still have trouble playing back RCE discs. But there has also been reports that some mono-region DVD players will also have trouble playing RCE discs - something that is quite possible when one tries to screw around with an established system. Once again, the DVD/Movie industry has shown that profits, is indeed, more important than its customers. Star Trek on DivX - coming to a Windows Media Player near you There is currently a petition going on to urge Paramount Pictures, the owners of the Star Trek product license, to release an online downloadable/streamable version of their Star Trek TV series. There are already hundreds of signatures on the petition, and once they reach critical mass, they will be sent to Paramount to hopefully let them know what fans want. Personally, I think if Paramount does release online versions of their TV series, and if they do charge a reasonable amount per episode, they could potentially make quite a fortune, as most Star Trek/Sci Fi fans are already very active on the internet, and with broadband become more readily available, there is great demand for high quality digital entertainment. P.S : If you signed the petition before the 13th October, please sign it again, as most of them were lost. 3. US Politics or "What does this have to do with DVD/DivX?" Look at all those pretty colors ... As I type now, the US elections may still be undecided, following the electoral deadlock, which most likely will only be decided by whoever wins Florida. So what does have that have to do with DVD or DivX ? On the surface, nothing much - but if you look closer, this election does indeed have some impact on DVD/DivX and the Internet as a whole. First of all, it seems that whoever gets to be President will be appointing US Supreme Court Judges and may have a whole different spin on legal issues surrounding the IT industry. 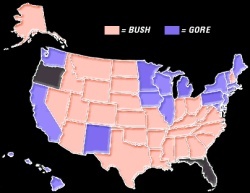 For example, A George W. Bush Presidency may mean a less harsh stance towards Microsoft. And with DeCSS, Napster, Scour and perhaps soon, even DivX in the legal spotlight, there is no doubt that the US government's stance will have a significant impact on these court cases - although the White House probably doesn't have all that much to say in these matters, but a few words from the President to support either side will be quite significant. And wouldn't it be interesting if the US Department of Justice desided to file a monopoly suit against the MPAA - not likely, but not impossible.